Sunday, March 29th, was the anniversary of the death of my best friend, Mary. She was diagnosed with a fast growing glioblastoma multiforme, grade 4 on 911, had surgery, radiation, and chemotherapy and then passed away on Good Friday. Mary was a delightful and multi-talented artist who always saw the glass as half-full... and sometimes brimming over. She was also the original 'momma' of my darling Gertie. The first photo above was taken when she was in Germany selling her original sculpted dolls on HSN Germany. She's holding the factory version of her first doll, Lucinda. 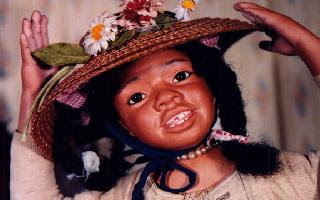 All the other dolls are some of her original sculpted dolls. The head, arms, and legs are porcelain and the bodies are cloth. An armature allows the dolls to be posed. 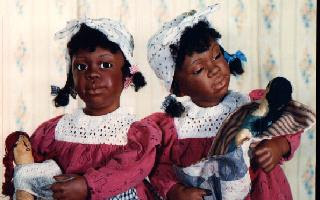 Most of Mary's original dolls were about 24" tall and all were dressed in vintage/antique clothing which Mary altered and/or remade to fit them. She liked to present her dolls in vignettes suggesting a story and she loved having her dolls playing "dress-up" ("Jazz" was designed to be playing dress-up with one of the girls whose photo I can't find right now...).... and Mary just loved searching for all the little accessories that made her dolls unique. 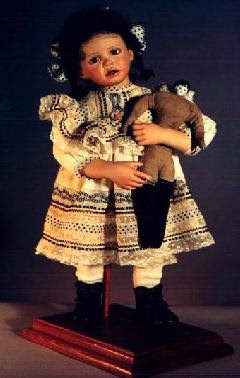 Mary also made gorgeous reproductions of French and German antique dolls. I'll post some of those another day. It has been seven years since Mary died and I still miss her so much. She was truly a bright spot in my life and I'm lucky to have had her among my friends. I'm sure she and Gertie are in heaven with many squirrels for Gert to chase and flea markets and gardens for Mary to explore. What lovely creations. 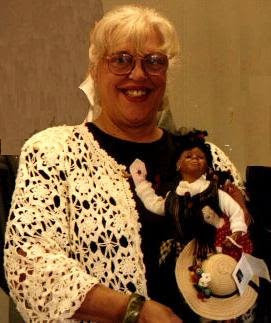 Mary was an extremely talented lady, and her wonderful dolls will remain as her legacy. Beautiful dolls! She did great detail and work. 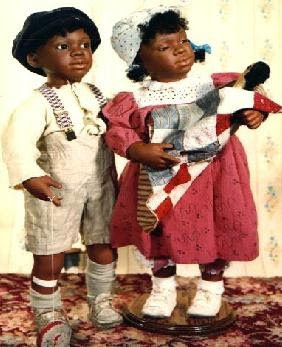 You can tell she loved dolls and she loved making them! Glad you have so many good memories of Mary & Gertie both...I am sure they are up there telling all sorts of stories about you...LOL..
Mary was my cousin and I'm delighted to see I'm there are others who remembers her and her art so fondly. Thanks for this lovely tribute.